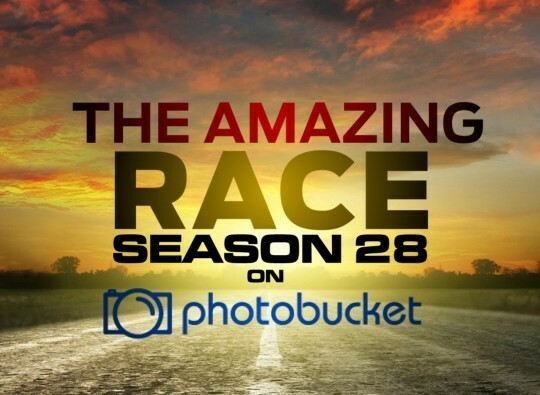 Recap: The Amazing Race 28, Episode 11 – "Just pee your pants. I swear, just pee yourself." All teams are on the same flight to Shenzhen, China. Their next clue awaits at the Departure Hall of the Shenzhen Airport. After Tyler & Korey lie to Sheri & Cole, all teams must take a bus and train to the Eiffel Tower at Window of the World. Here, teams will find the Road Block: Who wants to see the world? For this Road Block, teams will be given riddles that will lead them to six of the 130 replicas of the world’s most iconic landmarks standing here at Window of the World. At each landmark, teams will collect a sticker and when the immigration agent approves them all, they’ll get the next clue. Tyler, Dana, Burnie and Sheri do this Road Block. Tyler and Dana work together, but they mistake Angkor Wat for the Tahj Mahal. That allows Burnie to get all six correct on his own before the “jackasses.” But all three teams end up on the same train to the next Route Marker at the Moon Bridge in Lychee Park. And at Lychee Park is the Detour: Commuter Cycle or Master of Arts. 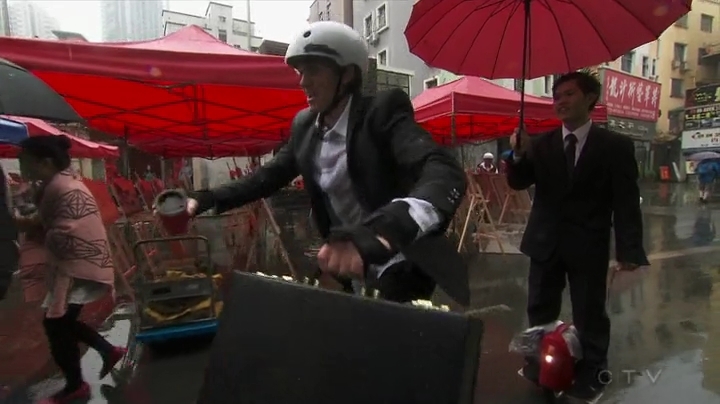 In Commuter Cycle, teams must put on suits and use motorized unicycles to commute through the city with a briefcase and coffee. In Master of Arts, teams head to Dafen Oil Painting Village where they must deliver and properly display paintings. BFFs Tyler & Korey and Dana & Matt choose Master of Arts while Burnie & Ashley choose Commuter Cycle. But Burnie & Ashley have trouble learning the unicycles, so they decide to switch. Sheri & Cole head to Commuter Cycle and get started. Tyler & Korey and Dana & Matt finish the Detour and can now find the Pit Stop on the Shenzhen Library Terrace. Tyler & Korey finish first with Dana & Matt taking 2nd. As the rain starts pouring in Shenzhen, Sheri & Cole are getting closer to getting their balance while Burnie & Ashley have finally finished the paintings. Sheri & Cole start rolling through the alleyways. They are able to fall off and get back on, but they must stay close together. Once they reach the destination, their fellow office workers give them the combination to their briefcases which has the next clue. It’s a race for the Final Leg and it’s Sheri & Cole who claim that final slot. Burnie & Ashley are eliminated. This actually might have been a nice middle Leg or even an opening Leg visit to China. A new Chinese city too, which is good. I liked the Road Block. It seemed a little easy though. Definitely not as hard as the editing made it seem. But even I got most of the clues quick. The only one I had no idea about was the battle reenactments which made me immediately think of TAR8’s Civil War Detour. This Road Block was more about teams running around. The Detour was alright. I definitely enjoy those unicycles. But allowing teams to fall off and get back on is a cop out. A real task would’ve been to have teams go all the way through without falling. But the other side of the Detour was too easy. There was absolutely no challenge to it. The only difference would likely be the distance between Route Markers. But even then, the tasks were very simple. Overall an okay Leg, but not really penultimate Leg-type of material. Welp, Sheri & Cole are the only team I’m rooting for to win this misguided season. They’d certainly be the most tolerable. But Sheri herself has done an awesome job all season long. Definitely much more enjoyable and tougher than Cole has been. Dana & Matt are such a waste of potential. They were a boring couple for all but two Legs in terms of dysfunction. And they weren’t particularly strong Racers either. Very boring. Burnie & Ashley have also been very boring despite their obvious attempts at positioning themselves as some kind of strategic gamers. And Tyler & Korey are just annoying. They’ve been TAR22 Joey & Meghan x10. And that’s not good at all.